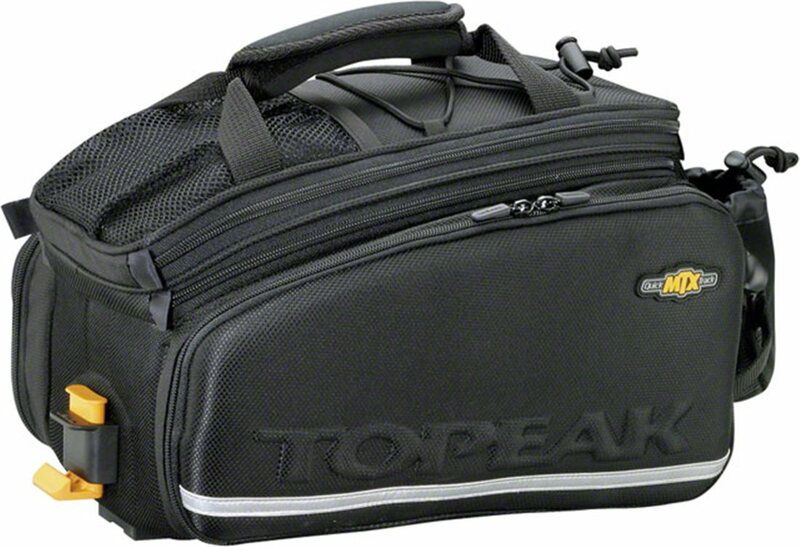 Topeak Quick Track Trunk Bags are compatible with Topeak MTX racks and feature an insulated main compartment with molded EVA foam sides, top and bottom making them great commuting or shopping. I bought this to use for commuting and love it. It attaches easily and securely to my Topeak rack and lets me take it off quickly. I love the flexible sides - somedays I only need the main section for tools, lunch, raingear, etc - and sometimes I fold out the paniers to carry an extra set of clothes. I also like the provision to attach a back light. Nice to place items like cameras, lunch, books,tools. Well thought out design, fits the rack very well and secure. Will buy more for my road bikes. GREAT BAG . HOLD EVERYTHING I NEED AND THEN SOME . GREAT FOR CRUISING THE BOISE RIVER W/A FLY POLE AND STUFF . Highly versatile, easy to pack, and quick to get on and off the bike. The panniers are NOT waterproof but there is a rain cover you can purchase separately that installs over the bag to keep the water out. I ride with this bag to/from work every day. It looks great and holds all my stuff. i use this product for commuting to work six days a week round trip about 15 or 16 miles. the panniers are generous enough so i don't have to very critical of what i pack. i carry a full repair kit, change of clothes,rain gear and my fuel (two tupperwares of leftovers) with more than enough room left to pick up that gallon of milk i should have got yesterday on my ride back home.carries very comfortably from handle or shoulder strap when taken off rack. For over a year, I used the Topeak MTX rear basket and threw my backpack in the basket to commute to work. 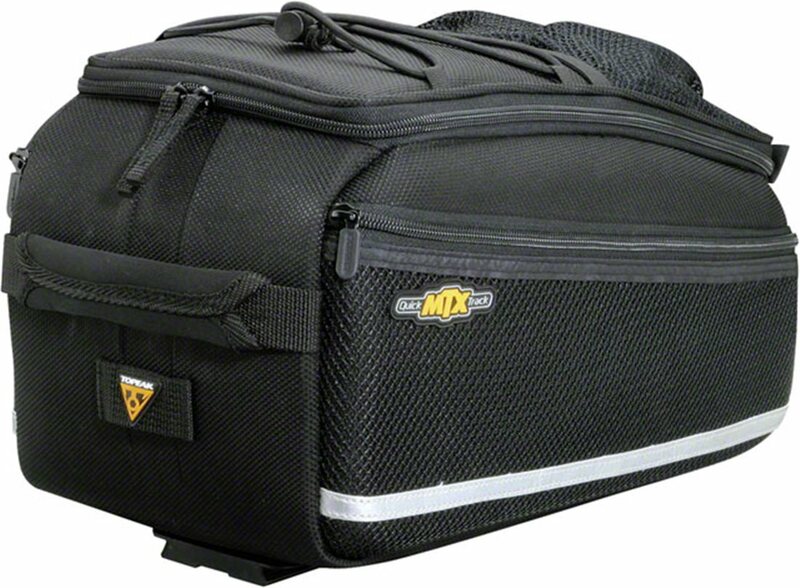 All along, I knew of and wanted one of these Topeak DXP trunks w/ the panniers. I finally broke down, bought one, and have been using it for the past month. I love it! It's way more convenient and has a ton more storage capacity than my previous setup. I'll admit, it's pricey for a trunk. 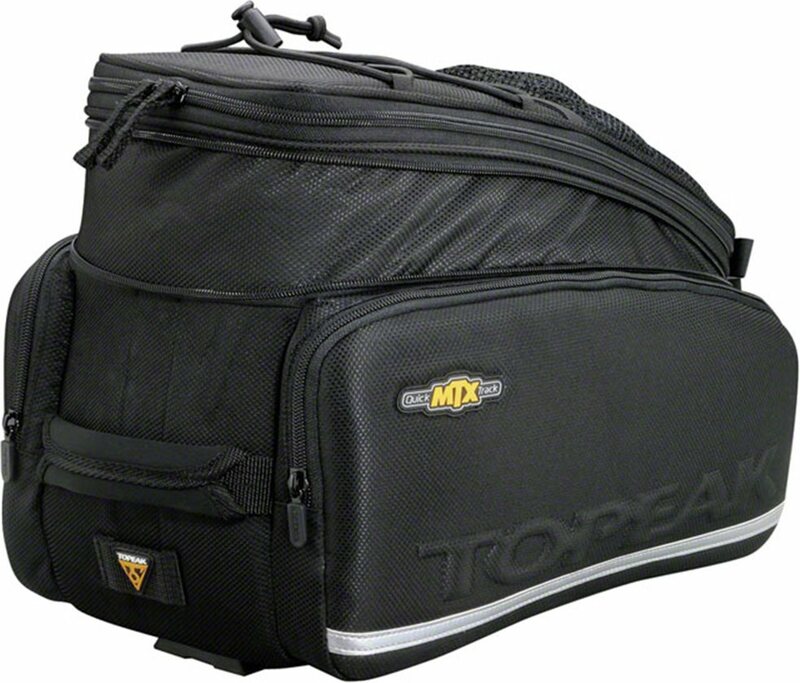 However, if you've already got or are getting a Topeak MTX rack, you will not be disappointed with this trunk! I use this for commuting to work in NYC to hold clothes, shoes, wallet, phone etc. It is quite spacious but would have been nice if it was a little bit wider (so that pants and shirts don't need to be folded). It fits in to the rack well and doesn't move about in NYC potholes. The panniers are a nice touch when I have to bring additional stuff from work such as laptop, etc. But the biggest issue is that there aren't really any pockets to store stuff. There is a little pouch on the inside (but no zipper or velcro to secure the contents). The side pockets can be useful but not available if you are using the panniers (since the panniers are folded up inside the side pockets). Its a bit of a surprise since Topeak products are usually more thoughtfully designed. So a very good product - good quality, stable on the rack and useful - but could be better. I ride to work with this pack, its really convenient and easy to use. The rack and pack are surprisingly solid, I can sprint and toss the bike from side to side and the system doesn't move. The only two downsides are that I wish the pack was just a hair larger, but also a bit lighter. I can't quite fit my shoes in, I've got to strap them to the top of the pack. It would be useful if the website listed the inside dimensions of the pack, not just the volume. The whole system, rack and pack together add several pounds to a lightish bike, making it a bit of a chore to commute. It feels quite durable though, so maybe a little weight is just the price to pay for durability and stiffness. I hate wearing a backpack while bike commuting - not enough air circulation. A rear rack with trunk bag is the way to go. My previous trunk bag was attached by 6 rip-n-stick straps. That could take a while to attach. (The Velcro would occasionally come loose, too.) This one is just slide, click, and go. Much faster and more reliable. This model is also highly expandable with two fold-away panniers. But, it is not perfect: Sometimes the latch does not entirely hold, or it shakes lose (this is quite rare). I counter this by wrapping the shoulder strap around the seat post. It works as a failsafe - like the safety chain on a trailer. I would also prefer it have more reflective material on the back. And, it should have a stiffer loop to attach a rear-facing light. The current one tends to droop, pointing the light toward the ground. Despite the minor short-comings, I have not found a better solution on the market. (Conventional), fit on any standard rear rack? Or does it require a specific rack from topeak as well?